Arizona Specialty Coatings professionally analyzes and prepares substrates to guarantee an environmentally-friendly polyurea application that weathers the harshest outdoor environments. Unaffected by temperature change, characterized with extreme flexibility and waterproof, polyurea is perfect for soil stabilization projects, water features, ponds, park furniture and many other outdoor projects. Many different methods for soil stabilization and erosion protection have been tried and tested. 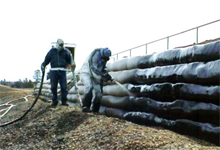 The use of polyurea coatings over geotextile materials is recognized as one of the safest and most cost effective ways to alleviate issues of soil stabilization during construction and protect the area from potential wind or water erosion after construction. Properly applied, polyurea dramatically increases the strength of the area without harm to the surrounding environment. Polyurea’s climate resistant properties allows for worry-free application in harsh temperature environments and in damp conditions. 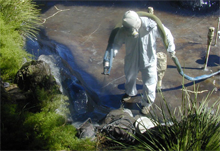 Used as a primary containment material, polyurea provides a seamless, waterproof, low maintenance liner for ponds, pools and other water features such as fountains. Polyurea is a 100% solid coating with no VOCs making it environmentally-safe for all plant and animal life. It can be sprayed over a geotextile material or directly on concrete to completely seal the structure and eliminate leakage. Polyurea comes in a variety of colors that can complement any outdoor design aesthetic. Polyurea coatings are known for their superior protection against water damage, weather-related destruction, impact and abrasion, chemicals and corrosion. Landscape designers and contractors are increasingly using polyurea coatings in a myriad of ways protect expensive landscaping equipment from corrosive chemicals and day-to-day use. 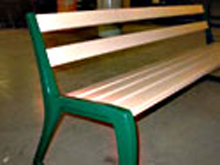 For weather-exposed furniture in public parks or outdoor venues, landscape professionals are choosing polyurea to extend service lifetime and keep furniture looking new.